Deanie’s was the first seafood market to open its doors in the quaint fishing village of Bucktown over 40 years ago. For three generations, Deanie’s has remained true to its Bucktown roots by serving the finest seafood prepared in the authentic and unique New Orleans culinary tradition. Deanie’s still prepares and ships delicious fresh and boiled Louisiana seafood to customers throughout the United States. Today we’ve reaffirmed our commitment to celebrating Louisiana’s bounty and the local fishing community by dedicating and partnering with the America’s WETLAND Foundation, a champion of Louisiana’s wetlands. The earliest structures were wooden huts raised on stilts, and the canal provided a harbor for fishing boats. The people who lived along the canal and out on the lake were squatters who made their living from fishing, crabbing, hunting and trapping, as well as from boat rentals, tackle and bait sales and entertainment for vacationers. Development along this area originally occurred in the mid-19th century with a commercial wharf and resort called Lakeport. Steamboats docked at the entrance to the New Basin Canal (now Pontchartrain Blvd.) and at the terminus of the Jefferson and Lake Pontchartrain Railroad, which ran along what is now the Orleans-Jefferson Parish boundary at the 17th Street Canal. The Jefferson and Lake Pontchartrain Railroad, 1853-1864, was an extension of the New Orleans and Carrollton Railroad, which is currently the St. Charles Avenue streetcar line. At the lake end of the railway were a hotel, restaurants, a bowling alley, dance hall, picnic ground, pleasure garden, and bathing facilities. The area later became a famous amusement park known as West End. Just across the 17th Street Canal, the rustic fishing village called Bucktown developed during the late 19th century. Wooden camps built on stilts covered by shingle or tin roofs lined the canal. Soon were stores, a schoolhouse, and a jail, as well as saloons, gambling houses, dance halls and clubhouses for sportsmen. During Prohibition, Bucktown was known for its speakeasies, houses of prostitution, and gaming dens. Gambling was legal in what was known as “the free State of Jefferson.” Bucktown was a rowdy, wide-open place where barroom brawls were common. The settlement is said to have been named for the young bucks who came there looking for a rough time. There are other stories about the origin of the name. Some say the village was named for the good deer hunting in the area. Others say it was named for a local fisherman, Oliver “Buck” Wooley. Amid the unrestrained gaiety, Bucktown was one of the places where jazz was born with such tunes as the “Bucktown Bounce” by Johnny Wiggs and the “Bucktown Blues” by Jelly Roll Morton. Until the recent years, the 17th Street Canal at Bucktown was home to a fleet of about one hundred shrimp boats. Yearly on the 4th of July, a festival was held for the Blessing of the Fleet. Through the years Bucktown remained a hub where fresh seafood could be bought from local fisherman. 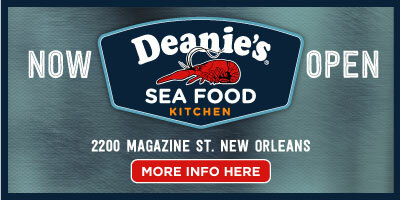 Deanie’s was the first market in Bucktown and one of the first to sell boiled seafood for retail sale in New Orleans. 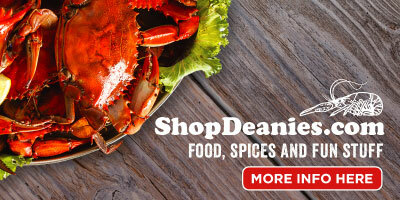 Today Deanie’s is more than a seafood market and two popular restaurants. It is a living symbol of an old, beloved fishing community called Bucktown. 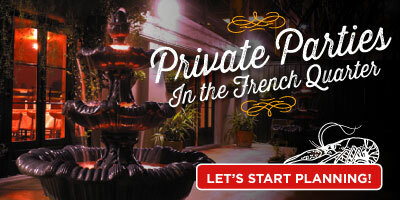 And rest assured, as long as there’s Deanie’s, there will always be a place to enjoy Bucktown just like old times.